Collage of galaxies included in the Herschel Reference Survey, the largest census of cosmic dust in the local Universe. A European space telescope has helped astronomers create the best map ever of the cosmic dust that forms the glue of galaxies in the visible universe, scientists say. Researchers used the European Space Agency's Herschel space observatory to the largest census of dust in galaxies near the Milky Way, studying over 300 galaxies in an attempt to nail down the properties of an important ingredient for the birth of stars and planets. 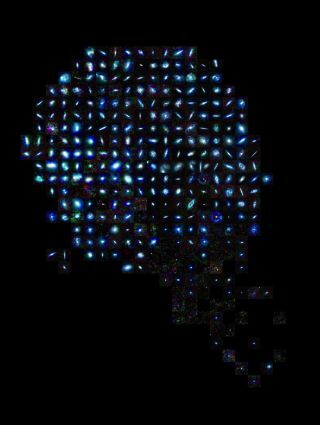 A sample of galaxies studied by the ESA's Herschel space observatory. Images on the left are shown in the infrared and submillimeter wavelengths. Images on the right, taken by the Sloan Digital Sky Survey (SDSS) show the galaxies in visible wavelengths. Dust may be a nuisance here on Earth, but in space, gravity pulls the particles together to start forming larger bodies. Herschel studied light emitted by the dust in 323 galaxies lying between 50 and 80 million light-years from the Milky Way. The census doesn't focus on similar galaxies but on widely varying ones, allowing astronomers a glimpse of the role dust plays throughout the universe. Spiral galaxies like the Milky Way, as well as irregular galaxies, tend to be dust-rich, with more star formation. Elliptical galaxies tend to lack the ingredient, and birth fewer stars. Stars heat the dust, allowing Herschel to observe the light in the far-infrared and submillimeter wavelengths. Collage of galaxies included in the Herschel Reference Survey as seen at visible wavelengths in images obtained by the Sloan Digital Sky Survey. Hershel's census revealed wider variations between galaxies based on their star-formation alone, implying that other properties play an important part in the birthing process. Further studies from telescopes on Earth will compliment Herschel's survey, providing greater insight into the role of dust in the evolution of galaxies. The census was one of the last scientific observations made by Herschel prior to the mission conclusion in April 2013.